Bone grafting is a procedure used in a broad range of surgeries that involves stimulating the formation of new bone in areas where new bone is needed. Examples of areas where new bone is needed include sites of fracture, diseased joints, complete bone loss, and artificial implants. Wherever bone grafts are used they provide both support and healing. Bone grafts are especially helpful during spine surgery. 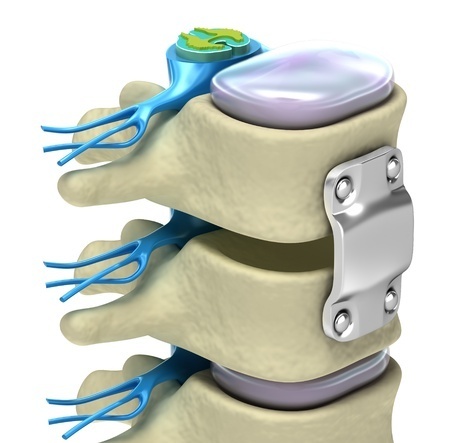 One form of spine surgery called spinal fusion forms a permanent connection between two or more vertebrae to eliminate motion and friction between them. Successful spinal fusion requires the same healing process as a broken bone. Therefore, bone grafts greatly assist in this healing process. Who should pursue Bone Grafting? If you suffer from a bone fracture that is not healing or a shattered bone in need of reconstructing, then your doctor may recommend you have a bone graft. Perhaps you have tumors or cysts in your bones that have caused gaps. A bone graft can resolve this issue as well. Older individuals with fused bones on either side of a joint or an artificial implant may find bone grafts invaluable in improving their condition. Prior to your procedure, your doctor will perform a physical exam and take several X-rays of your bone in need of a graft. He or she will also gather information on your medical history, so plan on sharing the medications and supplements you take or have taken as well as any surgeries you have had in the past. Your surgeon will discuss with you any possible complications you may incur following a bone graft. These complications include a reaction to anesthesia, bleeding, blood clots, infection, nerve damage, and even rejection of the graft. Graft rejection is usually minimized by extracting bone from one area of your body—usually your pelvis—and transplanting it onto the surgical site such as your vertebrae. Patients that receive donor bone grafts suffer a much higher risk of rejection. In an effort to avoid unnecessary complications, your doctor will also advise you to stop taking certain medications one week prior to you procedure. These medications are usually non-steroidal anti-inflammatory drugs (NSAIDs), blood thinners, anti-platelets, and some supplements. On the day of your procedure, an anesthesiologist will put you to sleep with general anesthesia. A nurse will trim or shave the hair covering the regions where your bone graft will be extracted and placed. Afterwards, he or she will clean those areas with a special antiseptic soap. Your surgeon will first make an incision over your hip in the region where you wear a belt. He or she will use a bone chisel to remove a piece of bone that will be used as the graft. Then, your surgeon will close the incision. Moving to your spine, your surgeon will make another incision directly over the vertebrae that need to be fused. Next, he or she will place the graft in between the vertebrae to form a bridge-like connection. In addition to the graft, your surgeon may need to stabilize the region around the vertebrae with plates or screws. Finally, your surgeon will close the second incision. Following spinal fusion, you will stay in the hospital for two or three days. During this time, your doctor may take another X-ray to confirm that your vertebrae are aligned properly with the graft. You may experience some pain, but it can be controlled with medication prescribed by your doctor. Monitor your incisions closely for redness, tenderness, swelling, and drainage. And if you experience chills or fever, contact your doctor right away, as these signs may indicate an infection. Allow several months for your vertebrae to heal and fuse together. You may even have to wear a cast or brace for a period of time to assist this process. Your doctor may also prescribe you physical rehabilitation to teach you how to sit, stand, or walk while keeping your spine properly aligned. Although spinal fusion provides symptom relief, it often results in more back pain in the future. Fusing vertebrae actually introduces more stress and strain to your spine, which can ultimately make your spine degenerate faster. So, it may be necessary for you to undergo another spinal surgery. However, having the right surgeon can not only minimize your complications, but also maximize your satisfaction with your spine surgery results.